Neil Bullock was introduced by Bryan as "the drummer “and you won't find any dissenters around here. He is in fact another of the select few mentioned above and every time he plays here is a reminder that we're unlikely to see anyone better. Musically, this is an album at last dominated by Bush’s piano and vocal. Where Aerial conjured its perfect summer day with leafy overlay, 50 Words For Snow begins and ends with tracks – ‘Snowflake’ and ‘Among Angels’ – that foreground a seemingly transparent mix of keyboard and voice. Though this may be simpler record than any she’s made for a long time, it’s by no means sparse – Steve Gadd’s drums in particular are extraordinary, spectral and driving at once, and reminiscent of Neil Bullock’s best work on Broadcast’s Haha Sound. The piano parts are lush and warm-sounding, and Bush’s vocals generally tender, though there are exceptions at points in ‘Lake Tahoe’ and ‘Wild Man’ where her shrill top tone is used within a denser arrangement to add drama (“while crossing the Lhakpa-La, something jumped down from the rocks!” she squees joyfully over Andy Fairweather Low in the latter, her tone alone providing the exclamation mark). Taken from: THE COLLAPSE BOARD REVIEW Kate Bush – 50 Words For Snow (Fish Music/EMI) by Petra Davis. Taken from: FACT Music News, New Music : Broadcast 'Man Is Not A Bird' from HaHa Sound, Warp. The real star of HaHa Sound, though, is drummer Neil Bullock, a concert and session drummer who earned his chops in the British jazz scene. 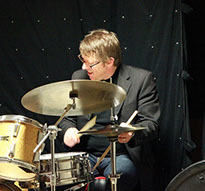 The band recorded Bullock’s parts in a local church, and his intricate, dexterous rhythms are a vital ingredient in the album’s success. ‘Man Is Not A Bird’ plays like a showcase for his talents, its rolling snare, thumping toms and Echoplexed cymbal hits giving way to an extended outro that lets him cut loose. Bullock toured with Broadcast to promote the album, and Cargill cut a series of additional library-inspired pieces with him for the first volume of the group’s Microtronics tour EPs. His presence was so distinct that when he left the group to pursue other gigs, Keenan and Cargill never replaced him.